A small group of Cambridge University Library incunables and an early 16th-century edition decorated by woodcut illustrations and initials brings to light a previously unnoticed dimension to the collecting habits of William Mitchell (1821/22-1908), the elusive donor of a very fine collection of Renaissance German woodcuts to the British Museum (see Stephen Coppel, William Mitchell (1820-1908) and John Malcolm of Poltalloch (1805-93, in Landmarks in Print Collecting: Connoisseurs and Donors at the British Museum since 1753, ed. Antony Griffiths. London: British Museum Press in association with the Museum of Fine Arts Houston, 1996, 159-210; idem, ‘Mitchell, William (1821/2–1908)’, Oxford Dictionary of National Biography, Oxford University Press, Sept 2004; online edn, Jan 2009 [http://www.oxforddnb.com/view/article/66397, accessed 21 June 2010]). A bookplate inscribed “William Mitchell” is found on the pastedowns of six of these books. It shows the motto “Spernit humum” and a crest issuing out of flames of fire, a phoenix rising proper and holding in the beak an arrow slipped and leaved also proper, semee of mascles sable. 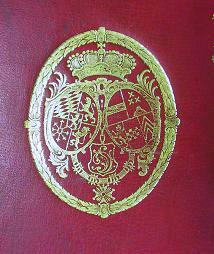 The bookplate is decorated at four corners by a mascle charged by a cross pattée. My tentative identification of the William Mitchell of the bookplate with the donor of the German woodcuts at the British Museum has been kindly confirmed by Stephen Coppel (private correspondence). Mitchell’s interest towards the unassuming Savonarola pamphlets was almost certainly stirred up by the presence of the woodcut illustrations which are interesting Italian counterparts of the German prints that he was actively collecting. 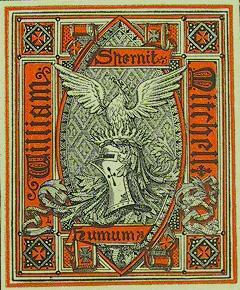 I believe William Mitchell also to be the owner of three more incunables that bear two different armorial bookplates which I regard as variants of the previous William Mitchell’s bookplate. 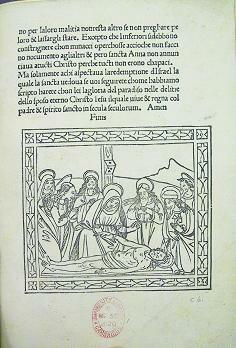 The first variant bookplate is found in two Savonarola’s pamphlets, Inc.5.B.8.8 and F150.c.2.4 respectively. 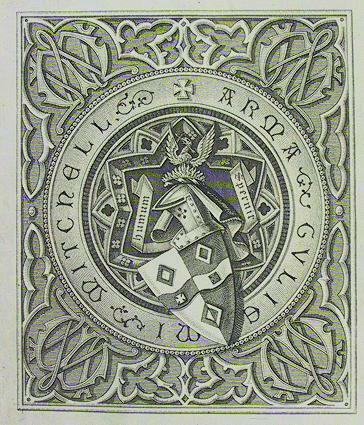 A decorative border, with the initials “WM” intertwined at the corners, surrounds the roundel inscribed “Arma Guillelmi Mitchell” that encircles unrecorded arms, with crosses pattée and mascles as charges, and the same crest and motto as in the previous bookplate. 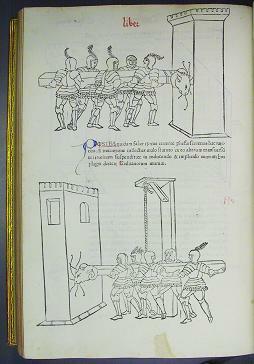 The second variant bookplate is found in a copy of the famous princeps edition of Robertus Valturius’s De re militari, printed at Verona, by Johannes Nicolai in 1472 [Inc.2.B.19.1]. 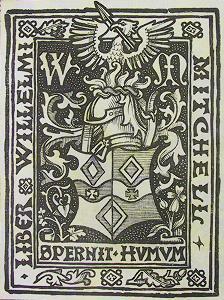 The bookplate bears the same initials, arms, crest and motto, but the inscription “Liber Willelmi Mitchell” gives a Germanic flavour to the name of the owner, who was apparently “born a British subject” in Baden, Germany. According to Gambier Howe, exemplars of all three bookplates should be found in the Frank Collection at the British Museum (see E.R.J. Gambier Howe, Franks Bequest: Catalogue of British and American book plates bequeathed to the Trustees of the British Museum by Sir Augustus Wollaston Franks, 3 vols. London: 1903-1904, vol. 2, p. 258, nos 20744 or 20745, 20747 or 20748, and 20746). 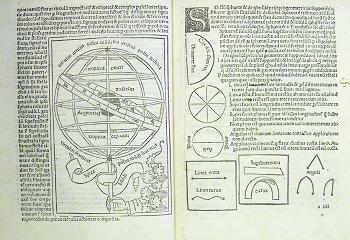 The Valturius princeps was the first incunable edition to be illustrated by woodcuts of technical or scientific character and therefore an almost obvious and unmissable presence in Mitchell’s woodcut collection. and possibly Prince Charles Maurice De Talleyrand-Périgord (1754-1838), Bishop of Autun, before coming into the hands of the writer and art collectior William Beckford of Fonthill (1760-1844). It was donated to the library by John Charrington (1856-1939), Honorary Fellow of Magdalene College Cambridge and Honorary Keeper of the prints at the Fitzwilliam Museum, alongside all other Mitchell’s incunables. 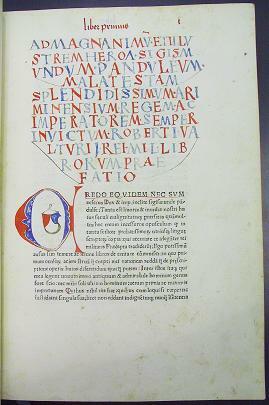 Other late 15th– or early 16th-century editions of Savonarola works from the collection of William Mitchell can be found in the Library of Congress of Washington; a copy of Sacro Bosco’s Sphaera mundi, printed at Venice by Johannes Lucilius Santritter and Hieronymus de Sanctis on 31 March 1488, owned by Mitchell and C. W. Dyson Perrins (1864-1958) afterwards, is now in the Rare Book and Manuscript Library of the University of Illinois (x523 / Sa14s / 1488). Confirmation of Mitchell’s identification and notice of other incunables from his collection would be gratefully received.